Posted by Anup Baral | November 1, 2017 : The autumn chill is deepening and while life in and around the City is slowly moving towards rest, the courtyards around Mangalbazaar, Patan begin to glow with thousands of people to watch the array of dances during the 10-day Kartik Naach. The courtyards were destroyed in the April 25 earthquake and wooden planks support old monuments and houses around, but the fervour for the festival has not been destroyed. 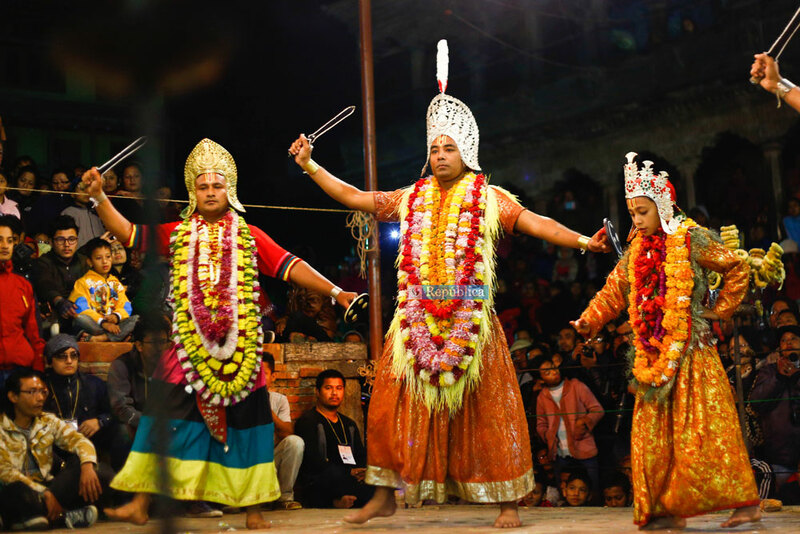 Kartik Naach (Kartik Dance) is an originally 27-day-long traditional dance and drama festival that takes place in the Hindu lunar calendar month of Kartik, which falls in October/November. This festival is performed on a public platform in front of the seventeenth-century Patan Palace, a World Heritage Site.